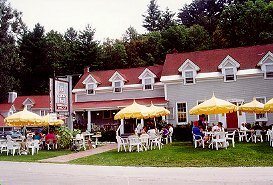 Stowe's Classic Vermont Country Inn. Conveniently located between Stowe village and Mount Mansfield. Our accommodations range from cozy inn rooms to romantic suites with wood burning fireplace, Jacuzzi and cable television. Sleep amidst locally made quilts and period antique pieces. Swim in our garden pool or soak in our outdoor hottub. Cross the street directly onto the Stowe recreation path or challenge each other to a game of Ping-Pong. Our fireplaced den is a great place to sample some of Vermont's finest microbrews as well as other fine beers and wines from around the globe. Legendary outdoor breakfast. Summer Garden lunch and BBQ. During the fall and winter enjoy gourmet cuisine in a beautiful candlelit dining room. Each winter afternoon sit by the wood stove and savor a complimentary Apres Ski Fondue. Nineteen rooms and Suites, Rates Range from $175 to $250 double occupancy including full American Breakfast. Deposit required. All major credit cards accepted. 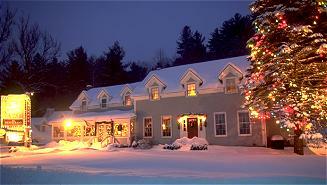 This and other Stowe Bed and Breakfast Inns can be found here in The Register.